On p903 of An analysis of continuous records of field intensity at broadcast frequencies, they have a formula with max sky wave field at 580 km. And they correlate that to their graph with peaks at 500 km, 1000 km, 1500 km (read the article for further context). Taking a look at the distance to Bobo & English Turn, 1,233 km and 1,709, respectively. That are approximately 2x and 3x 600km. Perhaps this is a coincidence and not related specifically to distance. Will need to look for other stations within ~100km(?) of those two. Moved here from the DGPS forum. I read that paper as well, and found the signal maxima at 500, 1000, etc km interesting. 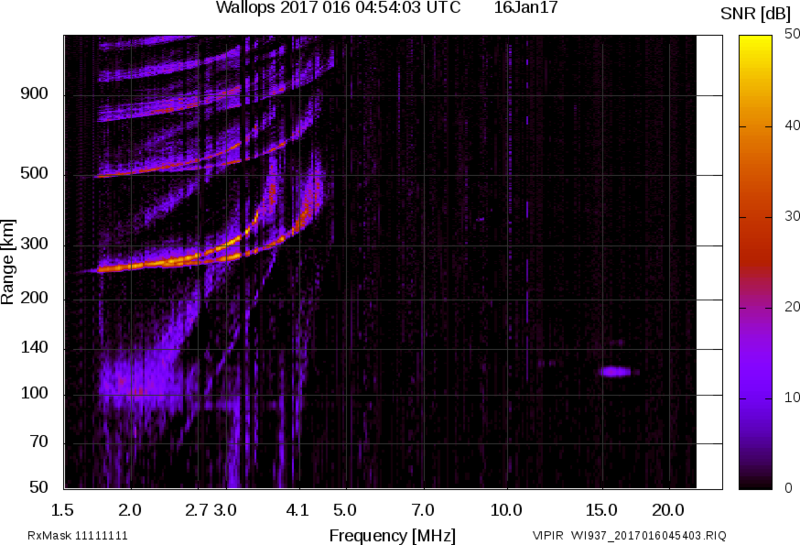 It appears they assume there are maxima in the radiation angle pattern for the broadcast stations. Since most stations (especially at that time) likely used similar transmitting antennas, that seems reasonable. In the end it boils down to geometry, if you know the virtual height of the E layer, and the distance between stations, you know the necessary angle of radiation. (The fact that the layer has a thickness probably complicates reality slightly) If you know the pattern, you can figure out where the maxima are. We could probably check this semi regularly and see how much it varies. Maybe there is tabulated data as well? It does not go below 1.5 MHz, but it looks flat around there anyway, so we can probably assume it is valid for 300 kHz. I do not know what types of antennas DGPS stations use, I assume very short verticals? Running a simple NEC analysis shows what you expect, a peak at around 14 degrees. The real antenna may have a bunch of peaks and nulls? As the E layer height varies, these peaks and nulls end up at varying distances away from the transmitter? What does 'RNO stand for? Back in that study, I don't think they had the precision that we'd have today and they made some assumptions. Have yet to find models of antennas for the sites, but found that the LBA Group makes DGPS/Navtex antennas and have a picture of them doing a test at Biorka. Does the "range" in this graph mean Elevation (km's in height), or Distance from the transmitter in km? An AM radio Boombox DXer. + GE SRIII, PR-D5 & TRF on MW. The usual Realistic culprits on SW (and a Panasonic). Range for the graph is the height of the ionosphere layer. The brightness at that point is the intensity of the reflected signal. In this case the transmitter and receiver are at the same location, what is being measured is the strength of the returned signal at a vertical incidence. I do not know what types of antennas DGPS stations use, I assume very short verticals? DGPS radiobeacon (transmitter) antennas typically 150' - 300' tower with top loaded element and a good ground plane. Short with respect to the frequency in use but large compared to the typical NDB antenna.